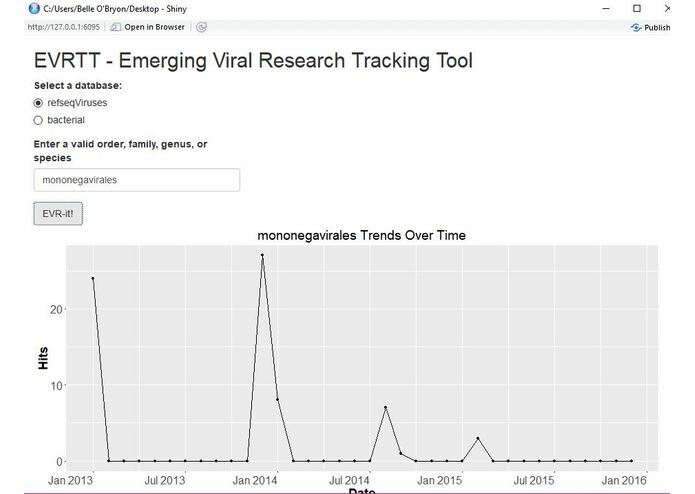 Our inspiration behind EVRTT was to create a tool to help the scientific community study trends in research over geographical and temporal scales. EVRTT ("Everett") is an R Shiny web application that is designed to track research publications both temporally and geographically. Users are given the ability to choose an NCBI database to search a virus (or virus subfamily) against. Hits are returned and parsed for pubMed accession numbers and year of publication. A line chart of publications by year is generated and displayed to the user. The pubMed accession numbers are used to access pubMed webpages and the HTML is parsed via regex to identify the geographical location of the author(s). These geographical locations are then passed to an R implementation of the Google Maps API, which uses latitude and longitude to overlay points on a world map. 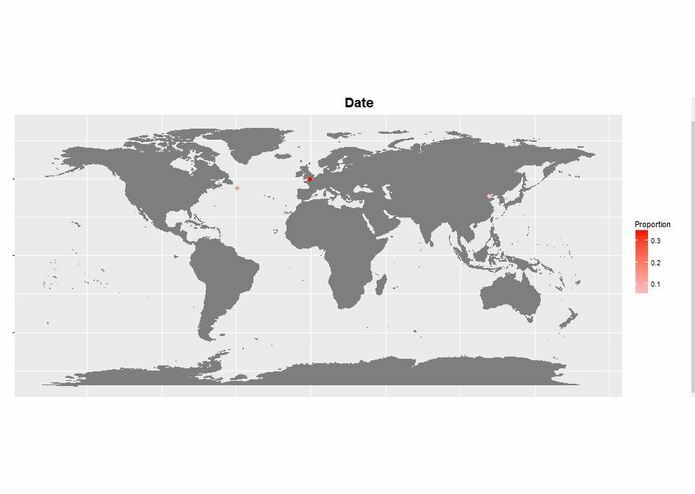 The darker red the location is, the more publications originated from this location. EVRTT is capable of running on a web server and provides an easy-to-use GUI, while also supporting multithreading for processing large datasets. EVRTT was built entirely in R and R Shiny (A framework for creating interactive web applications running R). It makes use of many packages, including R implementations of multithreading, Google Maps API, and various other packages (see citations in GitHub). Optimizing load times and retrieving the information via regex were both major challenges in the development of this project. Through a bit of perseverance (and a lot of Googling) we were able to overcome these challenges. This tool shows real, biologically relevant data and runs as intended. We learned the value of coordinated teamwork. The four of us split these tasks up evenly and learned to collaborate effectively. EVRTT is an easily extendable tool. In the future, we intend to add accessibility to more databases from NCBI and other institutions. We also hope to add more statistically significant data analysis functions. My primary function was as the "regex master." I developed the functions required to parse pubMed ids and the authors' geographical locations. I developed the front end in R shiny, helped integrate the back end, and implemented visual user-friendly tools for reporting progress in the analysis. Imported databases and created data structures to be used to create the plots.